Launched in late 2016, making it one on the newest bingo sites available to play on, the charitable Give Back Bingo is a bingo site for the kind hearted player. Give Back Bingo chooses a charity every single month (usually dog related) meaning the more that you play, the more the sites gives back to charity. Give Back Bingo is one of the four sites running the newfangled Daub software, alongside Lucky Pants Bingo, Kitty Bingo and Bingo Extra. Developed by Daub Alderney, part of the Stride Gaming Group – the original owners of Wink Bingo and Posh Bingo (so you know you’re in good hands) – the software is best thing to ever happen to online bingo. Well worth a shot if you’ve not tried it already. There’s a good selection of new player offers available at Give Back Bingo – from free spins to deposit bonuses when you become a new member. There’s no free, no deposit newbie offer unfortunately, but with software like Daub, you’ll be more than forgiving. 1. 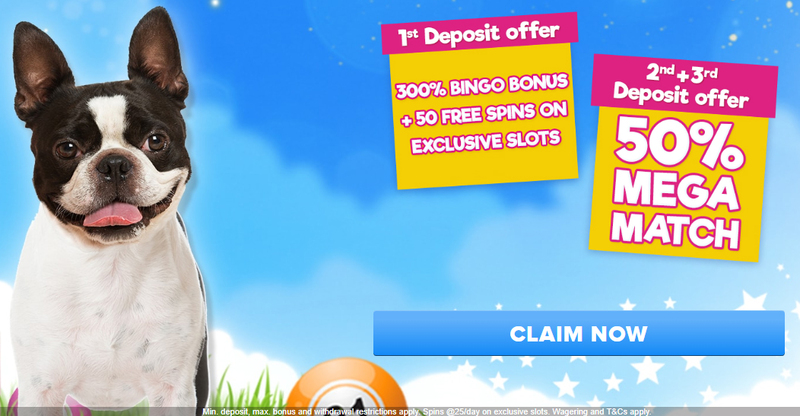 300% bingo bonus + 50 free spins on your first deposit! Try out Give Back Bingo with a first deposit and your efforts won’t go unnoticed. Give Back Bingo: Get a 300% Bingo Bonus and 50 Free Spins! You’ll receive a 300% bingo bonus + 50 free spins when you deposit £10 or more on your first deposit. That’s a huge bingo bonus and a flutter on the slots, absolutely free! 2. Get a 50% Match Bonus on Your 2nd and 3rd Deposit! Enjoying your little self? How about a couple more bonuses to get your winning streak working? Give Back Bingo: Get a 50% Match Bonus on Your 2nd and 3rd Deposit! You’ll receive a whopping 50% matched bonus on both your 2nd and 3rd deposit when you hit the ‘claim now‘ button and sign up today. That’s 3 bonus offers that you can use all together, no promo code required. Bingo is taken care of with the usual 90 and 75 ball go-to’s with a little bit of 5 line to spice up your life. There’s a huge amount of slots, table and card games as well as scratch and arcade so you’re more than taken care of. Choose from Exotic Cats, Hold the Safe and Fantastic Fireworks in the new slots selection – or how about Casino Hold ‘Em, Super Wheel and Deuces Wild in the table and card games. There’s plenty going on at Give Back Bingo, and with a charitable cause, who can say no? There is unfortunately no Give Back Bingo app available for mobile and tablet as of current. However, the website is responsive and works just as well on your iPhone and iPad as it does on you laptop, so you’ll never have to worry about finding your charger to play. Just tap in your passcode (if you’ve got one on your phone anyway), open your browser and you’ll be up and away with Give Back Bingo. Wagering with Give Back Bingo can be a confusing business, but you should always read the terms and conditions before signing up. Information written at the time of posting may also have changed, so always check to keep up to date. You should note that photo ID, proof of address and a copy of card my be requested at any time. Deposits and withdrawals can be made with numerous methods (as listed below) to make it as easy as possible to bank with Bingo Extra. A maximum withdrawal clearance time of 3-5 working days will be imposed after the approval time of 72 hours. A minimum deposit of £5 is available with a maximum withdrawal number of 10 per day. Minimum withdrawal is £5 via Visa with a minimum deposit/withdrawal of £20 with PayPal.